WHY: Sustainability trailblazer Kristy Caylor is bringing For Days, the membership service for unlimited fresh tees, to New York during Fashion Week. From September 12-29, For Days will open its immersive pop-up store in New York City’s Soho neighborhood, putting shoppers at the center of the closed-loop model. Since its May 2018 launch, For Days quickly racked up a lengthy wait list of potential members. With the opening of the pop-up shop this month, membership will be open to anyone that wants to join the movement toward a more sustainable future. 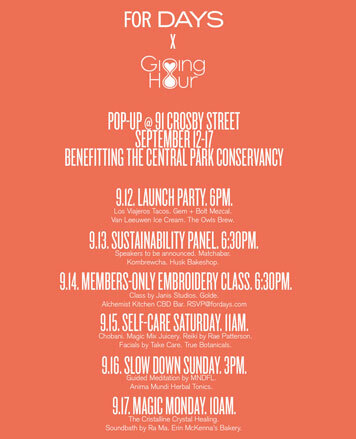 In addition to a full brand shopping experience, the September pop up will play host to an array of immersive programming, including sustainability panels, DIY workshops, and wellness activities. To celebrate the store’s opening on September 12, For Days will host a block party outside of its Crosby Street storefront from 6:00-8:30 pm. Open to the public, this community event will feature fun activities and refreshments from local vendors. To align with its environmentally-conscious ethos, For Days is teaming up with the Giving Hour to generate charitable donations for The Central Park Conservancy. For every t-shirt sold from September 12-17, $2 will be donated to the organization, which works to restore, manage, and enhance New York’s iconic park. For Days is a circular retail model that addresses our need for fresh basics without costing the environment. This new operating system for manufacturing and direct-to-consumer commerce will revolutionize people’s relationships with basics, starting with tanks and tees and eventually much more. The membership-based service provides unlimited access to new, 100% organic t-shirts, made in LA. Users can exchange a tee at any time, for any reason, for a fresh one in a style and color of their choosing. Once the new shirt arrives, the old one is sent back in the same, recycled packaging, and For Days will upcycle the materials to create new shirts. Prior to launching For Days, Kristy founded sustainable luxury brand Maiyet.